Almse Arenim is a Dunmer agent located in the Arenim Manor in Gnaar Mok. 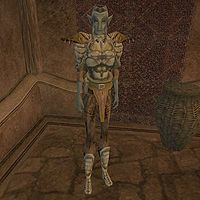 She is an Oathman of House Hlaalu, and a medium trainer in Short Blade, Light Armor, and Sneak. Almse wears a chitin cuirass with matching pauldrons and boots. She also wears a common shirt, pants, and shoes. In combat, she relies on a silver shortsword. Aside from her natural resistance to fire and the sanctuary provided by her ancestors, Almse knows no spells. This page was last modified on 7 September 2015, at 19:40.